It is the year 2274 and the descendants of a humanity ravaged by war, pollution and overpopulation are clustered inside a large domed city. Population control and distribution of resources is assured by a simple means: once people reach the age of 30, they are ritualistically killed in a ceremony known as the Carrousel to be reborn anew, or so the government propaganda would have it. Those who balk at this somewhat mercenary approach are known as Runners, and they are hunted down and summarily dealt with by a futuristic peacekeeping force known as the Sandmen. Vigilant Sandman Logan 5 (Michael York) is one of the most successful stalkers of those attempting to flee their fate. In the guise of double agent he begins an association with the free-thinking Jessica 6 (Jenny Agutter), determined to infiltrate the gang of Runners he believes her to have connections with. His unstated intention is to locate and destroy Sanctuary, the postulated haven where successful Runners congregate outside the hermetically sealed dome of the city. Combining elements of Planet of the Apes, 1984 and some of Arthur C. Clarke’s wilder flights of fancy, the film proved popular and financially lucrative upon initial release, though has been subsequently overshadowed in the popular consciousness by some of the decade’s better-known epics such as Star Wars and Alien. Despite being relegated to cult status however, the film holds up well and is a worthy addition to the dystopian subgenre. 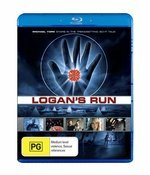 The special effects appear rather quaint by modern standards and given the age of the original print the picture quality is a little soft, yet on the whole Logan’s Run remains a well-paced and thoroughly entertaining affair. The strength of the material amply compensates for any technical deficiencies, and both Agutter and York, who is perhaps best known to modern audiences as Basil Exposition from the Austin Powers series, put in polished and believable performances. The film also contains some enjoyable cameos, including Farrah Fawcett as a ditzy medical aide and Peter Ustinov as a doddering old loner who inhabits the ruins outside the city walls. With a remake reportedly in the pipeline, now is the perfect time to acquaint yourself with this fun, vibrant and slightly kitsch slab of 70s sci-fi. The disc is affordably priced at around $20, and also includes an enlightening audio commentary with York, director Michael Anderson and costume designer Bill Thomas, who won a well-deserved Academy Award for his work on the project. Highly recommended for fans of all things dystopian, and those who prefer their sci-fi with a hint of vintage flair.